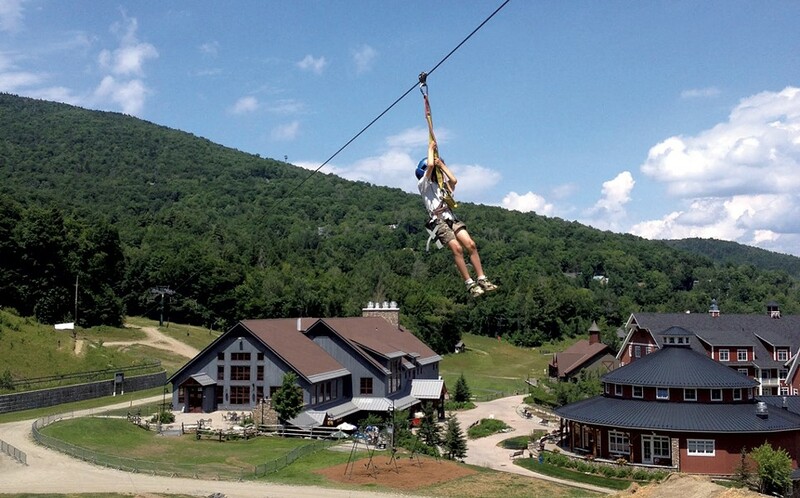 Sugarbush Resort — in the Summer | Destination Recreation | Kids VT - small people, big ideas! On hot summer days, my family longs for cool alpine air. Luckily, many Vermont ski areas offer year-round activities. Last month, my 8-year-old son, Zac, and I visited Sugarbush Resort for a ride on the chairlift and to try out the zip line and bungee trampoline. Our adventure started with a drive on Route 17, through Appalachian Gap. The windy road offers excellent views of the Green Mountains. We ski Sugarbush in the winter, but Zac had never seen it in the off-season. He was happily surprised to find it so leafy green, with a swing set and sandbox at the base area. We chose a five-minute bungee trampoline session for Zac ($11), two-ride zip line packages for both of us ($16 per person), and one adult and one youth chairlift ride ($16 and $11, respectively), bringing the total to $70. The bungee trampoline is a small square tramp with ropes and pulleys hooked to a harness that allows jumpers to get up to 25 feet of air and do high-flying tricks. Jumpers must be between 20 and 200 pounds and physically fit. The attendant strapped Zac into the harness and instructed him to stay in the center of the trampoline. He practiced doing somersaults in the air and even attempted a double backflip. After 10 minutes, his legs were tired and the harness was getting uncomfortable, so we headed to the Super Bravo Express chairlift, which runs continuously throughout the day. It was strange boarding without skis strapped to our feet, and Zac felt nervous as we lifted off the ground. But those nerves were soon replaced by excitement as he spotted his dad's favorite ski trail and observed the lush green forest, moss-covered logs and shaggy ferns from above. Wind blew through our hair and cooled our bodies — a delightful feeling on a hot, humid day. After 15 minutes, we arrived at the top of the mountain, where we discovered ski trails blanketed in grass and wildflowers. We sat on a boulder and enjoyed a home-packed picnic while gazing over the valley. The spot was ours alone, save for an occasional passing mountain biker — and a hermit thrush that serenaded us. The summit's chalet, Allyn's Lodge, was unstaffed, but the bathrooms were open. We stayed on top about an hour, exploring trails, searching for moose tracks, and looking at plants and butterflies before riding the chairlift down to the base. The zip line consists of an 800-foot cable strung between a high and low station. The attendant gave us helmets and showed us how to put on a harness. We climbed a few stairs to a wooden platform where he strapped the harness to a cable. There were no age or weight restrictions posted, but the attendant said that kids under 40 pounds might not gain enough momentum to glide across the cable. On the first 30-second ride, I struggled to stay face forward. Zac stalled near the end, so an attendant pulled him in with a rope. I was glad we bought the two-ride package — the second time around we were more confident and had smoother rides. Two turns felt like plenty to us, but we met a 14-year-old boy who had an all-day pass ($32) and was on his sixteenth ride of the day. We capped off our mountain adventure with a session on the swings, then made the scenic journey through App Gap back home. Not advisable for those scared of heights: The chairlift carries passengers to a vertical rise of 1,525 feet.